Massapequa, NY – Oyster Bay Town Supervisor Joseph Saladino announced that applications are now available to recognize all those with a connection to the Town who gave their lives and succumbed in their battle against 9/11 related cancers and illness. 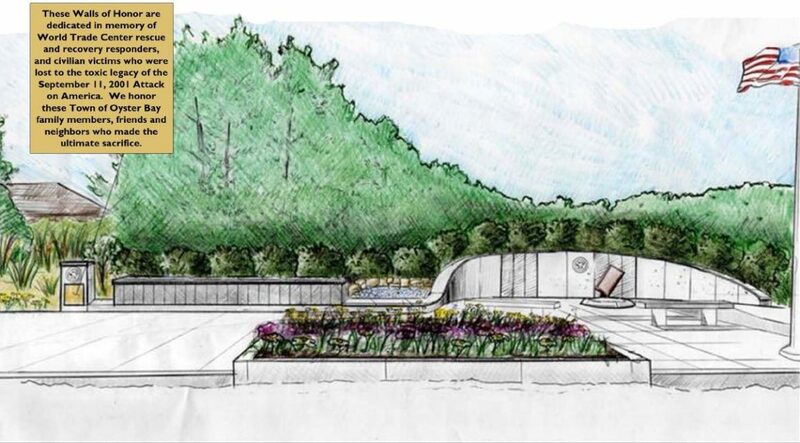 Over the next year, the Town of Oyster Bay will construct 9/11 Walls of Honor to the east of the current 9/11 monument, honoring those who continue to give their lives to the toxic legacy left behind by the September 11, 2001 Attacks on America. Each year, the Town will inscribe into these new Walls of Honor the names of family members, friends and neighbors lost to this toxic legacy. Recent reports from the World Trade Center Health program indicate that we are approaching a terrible milestone, in which approximately 43,000 people are being treated for medical problems and nearly 10,000 people have suffered cancers linked to the toxic exposure at Ground Zero. More than 2,500 responders and others affected have succumbed to their illness. Earlier this year, Supervisor Saladino formed a committee to develop plans to honor the lives of those who lost their battle to the toxic legacy of 9/11. Those serving on the committee included retired FDNY EMS Lieutenant Bill Gleason, Retired NYPD Detective Tom Luberto, Deacon Dave White, Jericho Fire Commissioner Frank Sammartano, North Massapequa Fire Commissioner Ralph Raymond, Massapequa Fire Commissioner Justin McCaffrey and Rescue & Recovery Worker Joseph Pinto.